If you own a laptop, smartphone or a tablet and feel that the built-in speakers aren’t doing the job as well as you’d like, Bluetooth speakers can help you get the audio experience you are missing out on. There are countless portable wireless speakers available that can outperform your default built-in speakers and offer hours of entertainment. What are Bluetooth Speakers and Why Do You Need Them? Bluetooth speakers are wireless/wired speakers which offer users a portable audio experience thanks to Bluetooth connectivity and a compact form factor. They come in all shapes and sizes and offer a range of features to customize your audio experience. Bluetooth speakers are not only great for users who are looking for a portable audio solution, but they’re perfect for home users too as they take up very little space and still manage to offer an outstanding audio experience. If you are either looking for a portable audio setup or want a better audio experience at home without being bothered by cluttered wiring and clunky setups, Bluetooth speakers may be the right choice for you. If you are in a hurry, here are the few handpicked Best Noise Canceling Headphones for 2019. During this festival season, Amazon is offering good discounts on best selling Noise Canceling Headphones below. We picked thirteen of the best wireless speakers available right now based on their features, build quality, audio quality, battery life and most importantly – the value for money that they offer. Very few wireless speakers manage to offer the right mix of features and audio quality with competitive pricing. Our picks are versatile and can suit the needs of the most ardent music lovers. JBL Pulse 2 The Pulse lineup from JBL not only offers portable Bluetooth speakers that pack a punch but also offer some great RGB lighting thrown in. The Pulse 2 comes with an integrated light show which performs a whole lot better than the first generation JBL Pulse. The flashy Bluetooth speaker is fairly compact, and its in built-LED lights emit through the speaker grille, making it one of the most aesthetically pleasing speakers we’ve ever seen. There are 12 different lighting options out-of-the-box that are built in, and you can use a companion app on Android or iOS to customize the lighting. The build quality feels quite sturdy and comes with a splash-proof design. You have access to a standard micro-USB port, a 3.5mm audio port and a microphone for calls. High resolution LED setup for lighting. The speaker is quite large and offers large drivers with plenty of bass. It is among the best sounding portable speakers we have reviewed and offers plenty of detail when listening to any genre of music. The DSP does a good job at handling audio, but there can be some minor distortions at high volumes. The speaker is rated for 10 hours of usage when using the speaker without any lighting and 5 hours with light shows enabled. With a large number of LEDs, the light shows are breathtaking, and they match the beats of your music as they play. Stellar battery life with light shows disabled. Balanced audio signature with minimal distortion. If you are looking for a speaker that offers not only great audio but also throws in a fancy light show, the Pulse 2 is one of the best speakers you can carry to a party. It offers all of the great features found in your standard JBL speakers and takes it a step further with the LED illumination. The sound quality is as good as it gets for speakers at this price point and they definitely pack a punch. JBL is known for some of the best Bluetooth speakers ever released, and very few are as iconic as the original JBL Charge series. The Charge lineup of speakers are known to offer not only a complete Bluetooth audio experience but they also double up as power banks for your smart devices. The Charge 2+ succeeds the Charge 2, and it is one of JBL’s newest Bluetooth speakers. Just like the previous power banks in the Charge lineup, the Charge 2+ offers a cylindrical design and comes with illuminated hardware buttons for media management. Unlike the original model, the Charge 2+ does not come with a carrying case. You get access all the important connectivity options including a 3.5 mm AUX input, a micro USB slot, a USB slot for connecting your smart devices for charging and a Bluetooth module for wireless connectivity. You also have a built-in speakerphone which you can use for calling purposes. 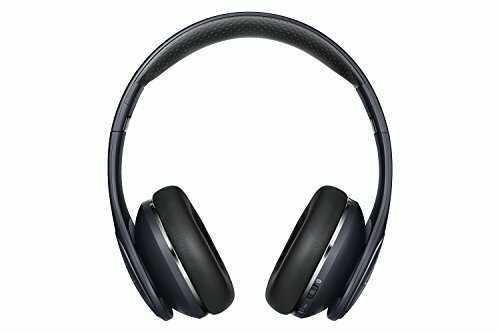 The Pro 2 is slimmer than the original Plantronics BackBeat Pro by 35% and is 15% lighter. It comes with a range of sensors to offer great noise cancelation. The headphones are designed to shut out ambient noise, and it works quite well in work environments and in the streets. The hardware control buttons on the headphones are quite responsive. The headphones come with a carrying pouch, a charging cable and an audio cable for wired usage. Plantronics claims that the headset can be used up to 330 feet away from a class 1 Bluetooth device like a smartphone which is quite impressive. Can charge other devices via USB port. Passive radiators offer 360-degree sound. 12 hours of media playback. Connects up to three devices at the same time. The Charge 2+ is a minor upgrade over the Charge 2 when it comes to audio quality. It offers the same sound signature we came to know and love when using the Charge 2 with its 7.5-watt drivers that offer tremendously accurate audio output. You have a cleaner sound thanks to the newly designed speaker grilles, and the bass seems to be tighter. The speaker is perfect for most genres, but if you play complex instrumental music, the speaker can begin to distort. Battery life on the product is stellar. JBL went ahead and included a larger than usual 6000 mAh battery for its power bank capabilities, making the Charge 2+ last much longer if you do not use your speaker to charge other devices. There are no official waterproofing ratings, and while the speaker is marketed as splash-proof, we would not recommend taking it to the pool anytime soon. The Charge 2+ can be used as a power bank. Social sharing feature to connect with other JBL speakers. The ports are not waterproof. The JBL Charge 2+ offers a complete package with great build quality, loud audio, and solid battery life. The digital signal processor does a great job at producing punchy audio with a good amount of bass. If you are someone who wants a top-rated wireless speaker with top rated hardware, the Charge 2+ definitely ticks the right boxes. The XSound Go from Tribit is one of the most affordable Bluetooth speakers you can get that that down skimp on features. While aesthetically it may be hard to distinguish the XSound Go from other generic speakers, it offers enough functionality and decent audio quality to make it a compelling purchase for its price. When it comes to build quality, it feels quite sturdy thanks to its matte-finished exterior and the Tribit speaker does have some weight to it overall weighing in at about 13.4 ounces. The speaker is waterproof, and you have access to a lanyard that you can use to carry it around or hang it from someplace. It comes with a built-in microphone, auxiliary input and a bunch of hardware buttons for media controls. You also have a micro-USB port for charging the speakers. Bluetooth 4.2 technology with up to 66 feet of coverage. Google Assistant and Apple Siri support. 6W drivers with dedicated bass radiators. What’s most impressie about the XSound Go is how Tribit managed to include powerful drivers on a budget. Bluetooth playback is great, and you can hear everything loud and clear from this tiny speaker. We tried a whole bunch of genres, and the speaker did not disappoint in any way. For its price, it fares quite well against other entry-level speakers that cost more than twice as much. Battery life is extremely impressive on the XSound GO with Tribit rating the speakers for 24 hours of usage, which is about twice as much as most Bluetooth speakers offer. Bluetooth 4.2 connectivity is rock solid, and you have no trouble discerning the subtle elements of tracks. While better speakers do exist, you have to give it to Tribit for managing to offer so much for such a low price tag. Premium build quality with rugged design. The Tribit XSound Go does have a few shortcomings but the value for money that the speaker offers definitely makes up for them. It is one of the best small portable speakers money can buy, and if you are not in a mood to shell out the big bucks for your first Bluetooth speaker, this is what you should be getting. The SoundLink Mini II by Bose is a mid-sized Bluetooth speaker that fits somewhere between ultra-compact offerings like the SoundLink Color and the large SoundLink 10. It is quite small without compromising on anything that makes a great wireless speaker including a solid pair of drivers that output great audio. The curved aluminum design is quite appealing, and it makes most plastic speakers feel cheap. 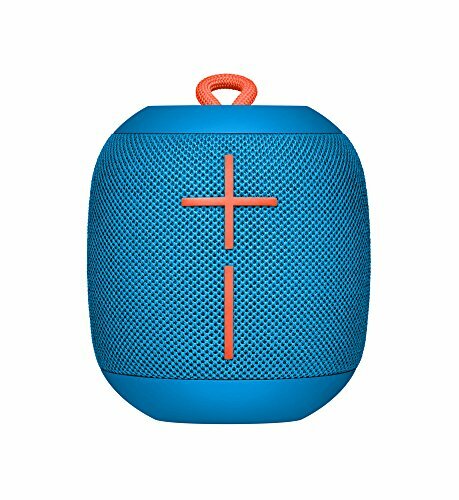 The ultra-portable speaker comes with large speaker grills and physical buttons to control media playback and volume levels. 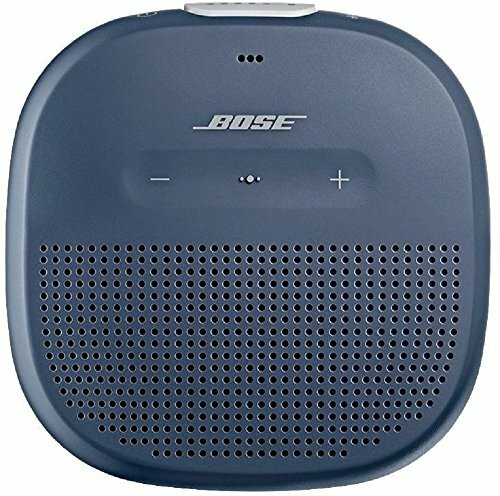 You also have a dedicated button to connect with other Bose SoundLink devices for a stereo audio setup. The speaker is also compatible with a proprietary dock which can charge the device if you don’t want to use the provided charging cable. Stable wireless connectivity with 30 feet of coverage. Omni-directional audio output with high volume output. In terms of sound output, the SoundLink Mini II does not disappoint at all. The acoustics and mid-range sounds are perfect while there is minor distortion when playing highs at full volume. Support for aptX or other quality-enhancing is absent, but the speaker does not seem to need any software enhancements as renders audio from any Bluetooth device quite well. If you are looking for a music experience that is detailed and is not too shrill or bass-heavy, the Soundlink Mini II is your best bet. The speaker comes with Bluetooth but does not have an NFC option. You also do not have access to a dedicated microphone but you can simply plug in any mobile headset into the 3.5mm jack, and you will be able to use your microphone hands-free with the Mini II as your audio output. Balanced sound signature with natural sounding vocals. Powerful drivers that enable great volume levels for its size. If you are a music lover who values balanced sounds more than punchy bass or exaggerated treble, the SoundLink II is a wireless speaker to pick up. It offers all of the connectivity features you need and a decent battery life rated at 10 hours, which should be enough for most users. 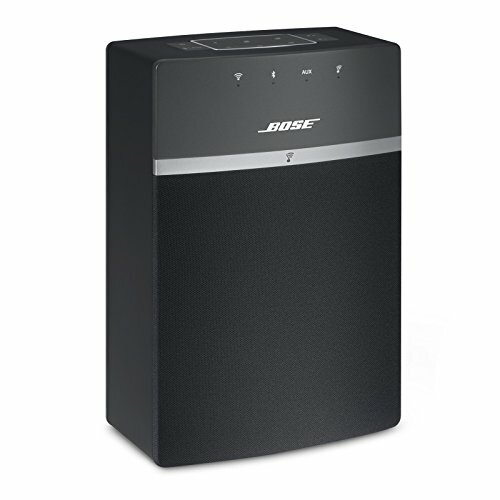 If you are someone who wants a wireless speaker strictly for home use only and do not plan on taking the speaker around while traveling then Bose’s SoundTouch 10 just might be what you are looking for. It is one of the biggest and bulkiest speakers you can find in the world of Bluetooth speakers, and it can put most TVs and wired setups to shame with its audio quality. Needless to say, the SoundTouch 10 is designed to be part of a multi-room system, and it’s small enough while also offering better audio what most TVs are capable of. Multi-room setups used to be expensive, but Bose’s offering is far from being overpriced. It costs about the same as any other mid-range Bluetooth speaker and offers all the features you need to connect with other multi-room audio setups. The build quality is pretty standard, and it comes with a great array of drivers. The speakers look quite ordinary with other more portable speakers being flashier in design. It comes with a remote/preset system allowing you to take full control of your audio setup. The speaker is fairly large, and you want it to sit in one corner of the room if you want to get the most out of its massive soundstage. The four drivers and two radiators pack quite the punch, and they make the SoundTouch 10 one of the best sounding Bluetooth speakers ever made. Support for Amazon Alexa speakers. Multi-room setup is compatible with dedicated wireless network. The SoundTouch companion app performs flawlessly and allows you to take full control of all the connected speakers in the SoundTouch Wi-Fi network. We had no trouble getting multiple wireless speakers to connect to Bose’s SoundTouch 10 Wi-Fi hub, and stream synced audio to all devices. Unlike most of the other Bluetooth speakers on the list, these require an external power input. The SoundTouch 10 is designed to be a multi-room speaker. Integration with popular services like Spotify, Pandora, Amazon Music and more. Can connect to TVs via 3.5mm Aux input. 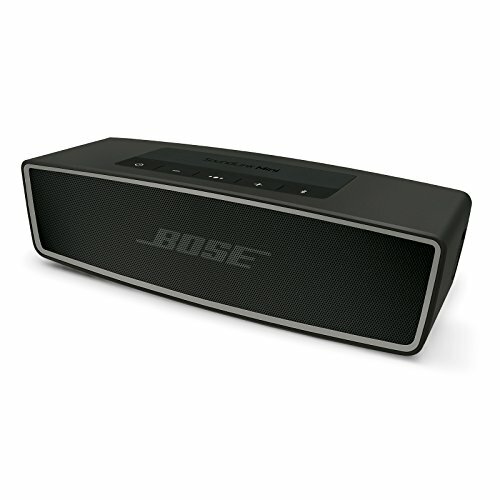 If you want a wired Bluetooth speaker setup that you want to pair for a multi-room audio experience, the Bose SoundTouch 10 can offer great audio quality at a fairly affordable price. It is one of the most affordable multi-room Bluetooth speakers available, and the Wi-Fi network coverage for syncing with other Bose speakers is stellar, to say the least. 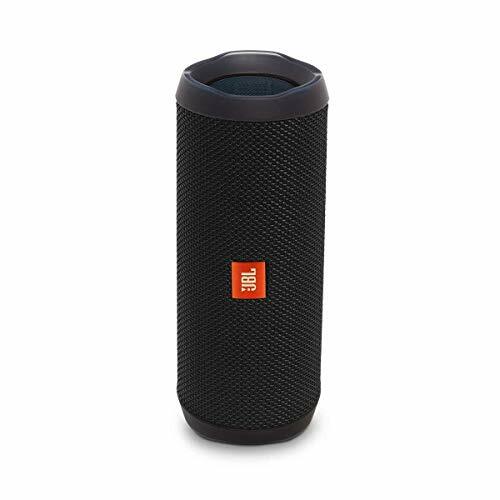 If you expect your new Bluetooth speaker to put up with a lot of abuse, then the JBL Flip 4 might be one of the best options out there for you. You get a rubberized build with armor-like elements to keep your speaker safe and sound. The speaker looks like it can take quite the beating and it offers excellent audio quality to boot. The cylindrical design on the Flip 4 is what you would expect from most full-sized Bluetooth speakers but the added ‘armor’ makes it feel extra-durable. The fabric grille is protected by the rubberized casing, and you get access to multiple hardware buttons to control your volume and media playback. Can connect to two smartphones at the same time. Rugged design that protects the Flip 4 from water, dust and shock damage. Passive radiators for added bass. The focus on the rugged design on the Flip 4 does mean that there are a few cut corners and unfortunately audio quality takes a slight hit. You do not get a true 360-degree speaker due to the rugged design. Instead, you get a bi-directional audio setup with the speakers firing from both sides of the JBL logo. The tonal balance is quite standard and offers a clean audio experience. There’s plenty of volume, but the lack of 360-degree sound can be problematic for users who are looking for a speaker they can simply drop in the middle of a room. The internals of the speaker includes two drivers and two radiators which can pump up the bass quite well. There is no noticeable distortion, and the speakers sound clean throughout all volume levels. With solid connectivity all around and quick pairing with Bluetooth devices, the software on the device performs as good as the hardware. Fabric grill for better audio. Sound quality is not as refined as mono-directional or 360-degree speakers. If you can live without a 360-degree speaker and ruggedness matters to you more than audio quality, you should definitely pick up the Flip 5. While the audio quality is nothing to scoff at, JBL put their efforts mostly into offering a speaker that you can use outdoors instead of focusing on the bells and whistles of what makes a good audiophile speaker. The affordable price tag and the right mix of features make it one of the most compelling wireless speakers you can get. Rugged speakers are in vogue right now, and most manufacturers are trying to push out portable speakers that can take a beating. Bose needs no introductions when it comes to audio peripherals but how do the SoundLink Micros fare when tipped against some of the best wireless speakers? Let’s take a look. The dinky design and indestructible form factor make it a perfect companion for outdoor activities. You find a solid plastic construction with a travel-friendly form factor. The speakers are far from flashy but are designed to get the job done. Water-resistance and shock-proofing are available on the SoundLink Micro if you plan on using the speakers by the poolside or end up dropping it a few times. The intelligently-placed strap makes it easy for the speakers to be carried around without much of a fuss. Rugged and compact design with tear-resistant strap. Unmatched bass output for a wireless speaker. Built-in speakerphone for taking calls. While the sound levels on the speakers are not as loud as much bigger Bluetooth wireless speakers, they still manage to surprise even the biggest of skeptics when it comes to volume output. The dual passive radiators allow the Micro to output a decent amount of bass without any distortion. We tried out multiple genres of music, and the Micro did not disappoint even once. The SoundLink Micro is one of the most affordable speakers from Bose, and it offers a surprisingly good audio experience despite its small form factor. You can easily hear the subtle elements of music quite easily combined with its stellar build quality; it truly is one of the best speakers you can get if you are looking for a compact wireless speaker. Extremely loud audio output for its size. Can pair with other Soundlink Micro speakers for stereo output. Battery life is average due to the compact form factor. The only shortcoming the speaker has is its battery life. Six hours might not be enough for many users, but considering how compact the Micro is, it was to be expected. Aside from the battery life issues, Bose ticks all the right boxes and you get a stellar audio experience at an entry-level price point with solid 360-degree sound. Ultimate Ears by Logitech is one of the most reliable brands if you are looking for cheap wireless speakers that can offer impressive volume levels. The WONDERBOOM is one of the most rugged Bluetooth speakers available with its unbreakable chassis. The pebble-shaped design looks quite distinct from the UE BOOM 2 we recommended earlier. While it shares the same rubber finish at the top and bottom, it has its own distinct rugged design. The speaker is marketed at users who want to use it during outdoor activities. The IPX7 rating on the product means that you can submerge it in 1m water for half an hour without worrying about any damage to your speakers. The WONDERBOOM comes with two 40mm drivers as well as two radiators which allows the speakers to be astonishingly loud. 360-degree sound with double radiators for added volume. Bluetooth connectivity ranging up to 100 feet. The entry-level sounds are great, and the UE WONDERBOOM but the mid-range is where the speaker falters a little. However, the flaw can easily be forgiven considering how affordable the speaker is. The speakers offer a rich bass thanks to the double radiator setup inside, allowing you to get a punchy audio experience. The battery life on the WONDERBOOM is quite impressive with UE rating the speaker for 10 hours of usage on a single charge. It comes with a companion app that allows you to control the audio using an iOS or Android smartphone. Rugged design allows the speaker to be used outdoors. Perfect for low and high sounds. Extremely affordable considering the loudness and build quality. Mid-range sounds fall short of expectations. When it comes to entry-level wireless speakers, the WONDERBOOM is truly one of the best options. If you are looking for something rugged that you can use while skateboarding or surfing, the indestructible construction, and loud audio output should definitely sway you into grabbing one of these. The Bose Soundlink Revolve Portable Bluetooth speaker is a great alternative to the Revolve+ if you want a more affordable offering from Bose that retains the form factor and features at a more affordable price tag. 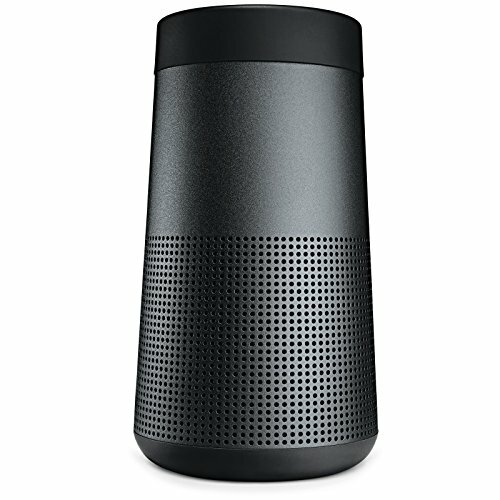 The Revolve is similar to the Soundlink Mini II with its cylindrical design. The aluminum housing makes the Revolve feel premium and includes a rubberized base with tactile buttons for controlling media playback and volume. The construction feels rock solid, and it definitely can handle a few knocks while being tossed around during your travels. It comes with a microphone for calling purposes and connects to devices via Bluetooth 4.0. 360-degree coverage ranging up to 30 feet. 12 hours of music playback. Bluetooth pairing via voice prompts. Can pair with another Revolve speaker for a stereo audio setup. Unlike other offerings from Bose including the SoundLink Mini or the SoundLink Mini II is the 360-degree audio output. If offers a great listening experience no matter which side of the speaker you are on. When it comes to volume, the speakers do a fantastic job of maintaining quality even when you max out the volume. It lacks bass response when compared to the Revolve+ which is expected due to the stark price difference between the products. Bass response is quite good on the speaker, and the expansive soundstage is better than most speakers available at the price point. Compared to many competing wireless speakers, the Revolve’s battery life of 12 hours is quite decent, and you can stretch it to 16 hours if you listen to music at low volumes. One of the downsides of the battery pack is the slow charging time which can take up to 4 hours to charge a fully depleted battery. 360-degree audio on a budget. Offers a microphone for calling. Apple Siri and Google Assistant support. Strong Bluetooth coverage ranging up to 30 feet. If you are looking for a cylindrical speaker capable of 360-degree audio output, the Revolve is one of the best speakers out there for sharing music in a room. It’s great for indoors usage only as it does not offer proper waterproofing and dust-proofing capabilities. If you have no budget constraints and all you want is the best possible audio experience you can get from a wireless speaker, then the SoundLink Revolve+ may be the perfect travel companion. Everything about the speaker feels premium, and the 360-degree audio coverage means you can place it in the center of a room and experience jaw-dropping audio from wherever you are. The Revolve+ comes in an aluminum enclosure that tapers at the top. You can choose from a Luxe Silver finish or a Triple Black color option. The cloth carrying handle is quite convenient for carrying the speaker around the house despite the hefty weight. Bose included rubber padding at the top and bottom to prevent any kind of external damage. You get access to hardware buttons for controlling your media and turning your speaker on or off. The Revolve+ has a 3.5mm aux input as well as a micro-USB port for charging. Bose also sells an optional charging dock separately if you do not want to use a micro-USB cable. 16 hours of usage on a single charge..
Wireless Bluetooth pairing with assisted voice prompts. When it comes to audio, the Soundlink Revolve+ comes with bass radiators and a transducer which faces downwards to disperse audio to all directions. There are no dead spots as you walk around the speaker and you get a consistent audio experience throughout. The speaker has extremely smooth treble and higher mid-range while the bass punchy and not overpowering. Overall, it is one of the best sounding Bluetooth speakers available at any price point. The Revolve+ promises 16 hours of battery life at medium volume levels, and you can connect it to a maximum of 8 devices at one go. For its size and portability, the Bose speaker does its job tremendously well. Can pair with another Revolve+ for stereo sound. Almost twice as expensive as other competing wireless speakers. If you are okay with spending the big bucks for the best audio experience you can get then the Bose SoundLink Revolve+ is one of the best premium wireless speakers you can get your hands on. Bose is one of the most iconic brands when it comes to audio equipment. From aviation-grade headphones to wireless speakers, the brand offers nothing but the best in the world of audio hardware. The SoundLink Color is one of the more affordable Bluetooth speakers available from the company and packs quite the punch. The speaker comes in five attractive colors and measures only 5.3 inches high and about 5 inches wide. The compact form factor makes it convenient to carry it around and can fit snugly in the corner of a room. It has a pause/play button and volume controls. Unfortunately, it does not come with a built-in mic for handling calls. Full acoustic sound range available. Eight hours of battery life via a Li-On battery. Loud one-directional audio output with aux-input available. Despite the affordable price tag, the SoundLink Color offers all the features available in more expensive options like the SoundLink Mini. Unlike older Bose wireless speakers the Color charges via micro-USB instead of a proprietary power connector. For its size, it offers a decent volume output, and the meshed grill design prevents any form of distortion at high volume levels. The Color comes with two drivers and a single bass radiator. In the audio department, there are no qualms when it comes to quality as they outperform most Bluetooth speakers you will find at this price point. Bose is known for its acoustic sounds, and the SoundLink Color is no different. Instrumental music what the speakers shine at playing and if you are someone who is into more complex music, then you should definitely consider grabbing this portable speaker. Acoustic audio sounds great on the speaker. No distortion at high volumes levels. Smaller battery due to the compact design. While its flat design might not be something, everyone is looking for if you are looking for an extremely compact wireless speaker that does not cut any corners in audio quality you should definitely grab the SoundLink Colo. The upscale metallic finish and portability make it stand out from the crowd, and it is a great product if you are looking for a speaker for smaller rooms. The JBL Charge 2+ is one of the most popular Bluetooth wireless speakers ever released, and the Charge 3 aims to outdo its predecessor in a bigger and better form factor. One of the standout features of the Charge 3 is the ability to charge a smartphone or tablet using the built-in battery. But how does the third-generation Charge speaker from JBL hold up when it comes to build quality and audio? Let’s find out. The speaker doubles up as a power bank using a micro-USB cable. When it comes to construction, you get a cylindrical design with plastic construction. There is a flattened platformed to ensure the speaker sits in place and you get access to a bevy of controls for Bluetooth connectivity, volume controls, and media playback buttons. Can also use a hardware shortcut to access Apple Siri or Google Assistant. 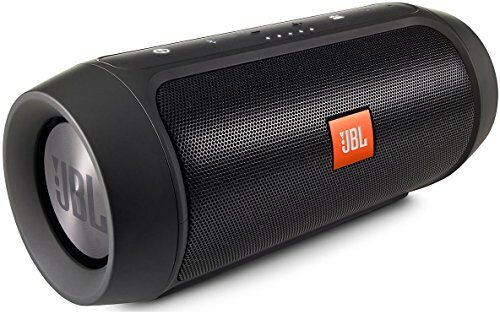 The speaker also comes with a hardware JBL connect feature that allows the device to connect with other JBL speakers in the area and play music in sync. 6000 mAh battery with power bank capabilities. JBL Connect with support for up to 500 speakers in an area. Connects with up to 3 devices at the same time. Unlike the Ultimate Ears BOOM 2, the cylindrical design on the Charge 3 does not mean you get access to 360-degree audio. The speaker offers one-directional audio output and drives 20W of power. It is quite impressive with a balanced sound signature. The volume levels are quite good and even in bass-heavy songs we did not notice any distortions. The speaker is quite sturdy, and the IPX7 rating means that you can submerge it under water or drop it a few times without it taking any damage. Its robust design doesn’t mean it cuts down on the style points either. It is on the more expensive side when it comes to the Bluetooth speaker offerings available, but the USB-charging feature makes it quite appealing. No distortion at high volumes. JBL Connect app for pairing multiple speakers. One directional audio output despite a cylindrical design. If you are looking for one directional-audio with loud audio output, then the JBL Charge 3 is one of the most appealing options available right now. It allows you to leave your power bank behind for quickly topping up the battery on your smartphone or tablet and its sturdy design makes it a perfect travel companion. The Ultimate Ears BOOM 2 is the successor to the massively popular Ultimate Ears BOOM which came out in 2013. The waterproof speaker lives up to the expectations that people have from the original BOOM and adds even louder volume and better battery life. If you are looking for a cheap Bluetooth speaker with amazing volume and a flat audio signature that does not overemphasize bass or treble, the BOOM 2 is a great wireless speaker. The 360-speaker design and compact form factor make the BOOM 2 easy to carry around. The speaker grille is divided by a rubber strip that goes right up to the top and bottom faces. You have access to physical buttons for controlling volume and power on a rubberized band. With a number of vibrant color options available, it is one of the most attractive speakers you can get. The BOOM 2 also comes with IPX7 certification, making it a perfect poolside companion without having to worry about a few splashes of water. Physical buttons to play, pause or skip tracks. Companion app for mobile devices to control playback. Waterproof and shockproof design with IPX7 ratings. When it comes to audio quality, the 360-degree sound that the original BOOM debuted in 2013, definitely is impressive. While the 2013 model had some minor sound quality issues, the BOOM 2 improves upon its predecessor to a great extent. With two 1.7-inch drivers and two passive radiators under the hood, you can crank up the speakers to really high volumes without any distortion. The bass levels are rock solid but not too aggressive, which makes the sound feel more natural compared to other bass-heavy Bluetooth speakers. The mid-range is where the speakers shine and if you want to fine-tune your audio experience you can use the iOS or Android apps to adjust the volume and control tracks. With 15 hours of battery life available on a single charge, you can definitely get the most out the speakers without having to worry about charging them. Great value-for-money Bluetooth speaker that improves upon its predecessor. Playing bass-heavy audio at full volume leads to slightly distorted audio. Android and iOS Companion app doesn’t offer an equalizer. Overall, the Ultimate Ears BOOM 2 speaker is one of the most attractive options out there for users who are looking for loud wireless speakers on a budget. The 360-degree audio output does not disappoint and works as intended. These are some of the best speakers at their respective prices points, and they all pack something unique to set themselves apart. Finding the right Bluetooth speaker is all about finding the features you need in your budget. Some people may value rugged design over audio quality, or others may not care about fancy features at all and want a truly audiophile experience. We have you covered on all fronts and hopefully have helped you find the right Bluetooth speaker.